Last week there was a scoring issue, which meant users were not awarded all of the points for their correct answers. To make up for it, this week's Parallelogram will be worth double points!. Every four years, the world’s leading winter athletes – the skiers, skaters, sledders and snowboarders – gather to compete for medals in the Winter Olympic Games. Of course, among the drama, bravery and triumph, there is plenty of room for maths! So, while you’re cheering on your favourites, don’t miss the chance to tackle these Winter Olympics maths puzzles. The Jamaican bobsled team was one of the most famous feel-good stories of the 1988 Games in Calgary. Jamaica’s Caribbean climate is not the most helpful for bobsledding, but the team borrowed equipment and asked for help. While the four-man bob team was unplaced after crashing in qualifying, the two-man team finished a creditable 30th out of 41. The movie Cool Runnings is – very loosely – based on their experience. 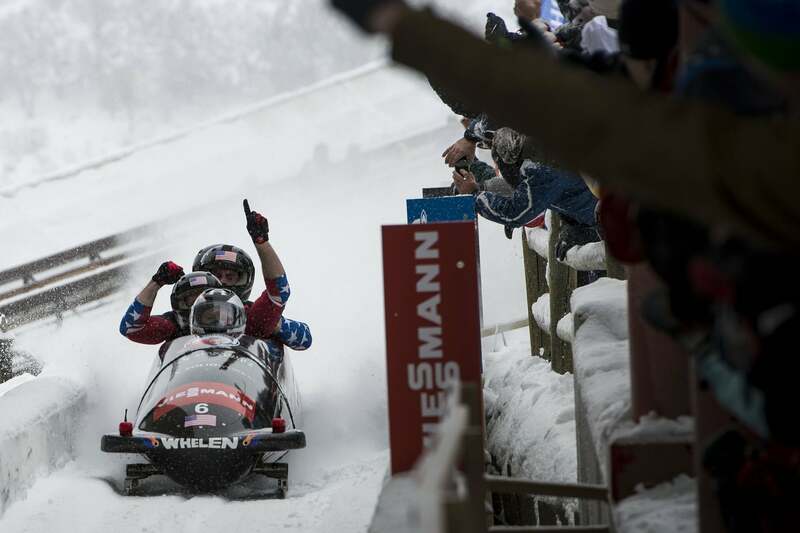 In the bobsled (or bobsleigh), teams of two or four pack into a streamlined sled and slide down a twisting, icy course with steep, banked corners as fast as they possibly can – often as fast as 75mph. It gets its name from early competitors who realised they could go faster by bobbing back and forth inside the sled! The 2010 Winter Olympics at Whistler, Canada, took place on a track 1,450 metres long. Each team had four runs at the course, and the winners were the team with the smallest total time. Feel free to use a calculator for these puzzles! 1.2 Silver medal puzzle: After their final heat, Canada were in second place with total time of 3 minutes, 24.85 seconds – but Germany, in third place, still had one run to go. In the first three heats, Germany had a total time of 2 minutes, 33.48 seconds. How quickly, in seconds, did the German team have to complete their final run to win at least a share of the silver medal? 3:24.85 is 204.85 seconds; 2:33:48 is 153.48 seconds. The difference, and target time, is 51.37 seconds. In fact, Germany’s final heat time was 51:36! 1.3 Gold medal puzzle: The USA’s second heat time of 50.86 seconds was a track record. What was their average speed in metres per second? Give your answer to the nearest whole number, and remember that the track was 1,450 metres long. Solutions 1,450/50.86 = 28.5096, which is closest to 29 m/s. The most famous ski jumper in history is not exactly famous for being good. Eddie “The Eagle” Edwards, self-funded and short-sighted, famously finished in last place in both the 70m and 90m events at Calgary, Canada in 1988, scoring fewer than half as many points as his nearest competitor. However, these scores are still the British records for ski-jumping! In 2016, a film of his exploits, Eddie The Eagle, was released. In the ski jump, competitors ski down a huge ramp, reaching speeds of up to 60mph before jumping as far down the hill as they possibly can. Each jump is awarded points based on two factors: the distance jumped, and the jumper’s style. Add on the style score. A group of judges awards up to 60 points for style – how well the jumper flies and lands. ...so the jump would be worth 110 points. Similarly, a jumper who manages 80 metres with 25 style points would score 65 points altogether. 2.1 Bronze medal puzzle: Albert the Albatross (of Albania) jumps exactly 90 metres and scores a perfect 60 for style. How many points does he earn? 2.2 Silver medal puzzle: Kelly the Kestrel (of Kazakhstan) jumps 95 metres and scores a total of 120 points. How many style points was she awarded? She has 70 for distance, so she must have another 50 for style. 2.3 Gold medal puzzle: Lemmy the Lemming (of Latvia) scores a total of zero, including no style points at all. How far did he jump in metres? To get 0 points for distance, Lemmy must have jumped exactly 60 metres. This puzzle and the previous one come from the Komodo website, which offers a programme of maths, largely aimed at younger children. I’ve used it with my son, and I think it offers a great way to practice core arithmetic skills. The puzzles were created by Colin Beveridge - a maths tutor, former NASA researcher, and writer of maths books including Basic Maths for Dummies. To understand the underlying physics in the previous question, take a look at this video that explains how to be a ski jump champion... and then answer this question. 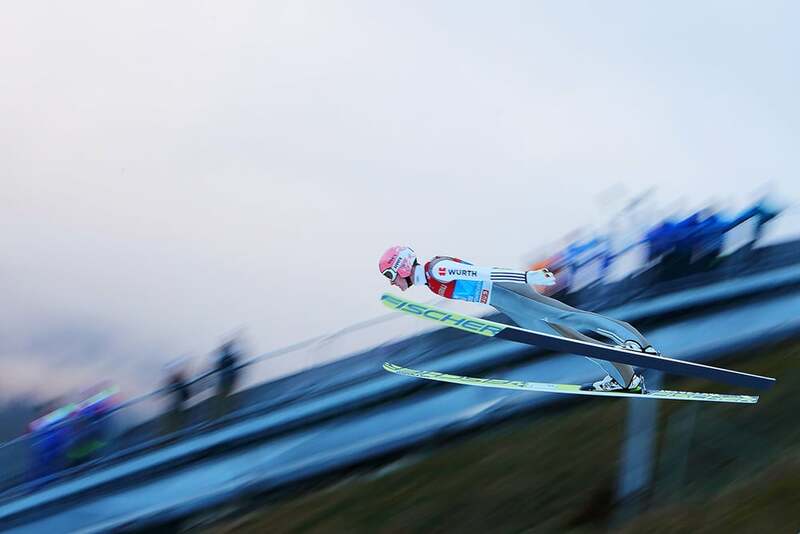 3.1 In the 1960s, what formation did ski jumpers make with their skies?